This is probably going to bore you to death if you don't like the most iconic British aircraft ever. It's detailing the work I'm doing to whif the Spitfire family, taking in the Supermarine 224, the Spitfire, Seafire, Spiteful, Seafang and Attacker. Yesterday mainly saw me sorting through the umpteen boxes of kits, trying to get all the Ventura (now Jays) kits into one place, for reasons that I'll come to later. It was... interesting to say the least and in some respects, I didn't know I had quite that many. Sorting through the boxes of part started and nearly completed airframes will be even more of an eye opener. Still, it got everything tidied away and certain kits sorted and grouped together, for example the Heller XVIe in the black boxing into one box (an A4 paper box will take ten), Airfix PRXIXs into another. You get the picture. So, why did I want all the Ventura ones together? Well, apart from wanting to know how many I had (multiples of each kit, with the FXIVe having the most - 7), I wanted to strip several of their wings with a view to moulding and casting them. Strictly for personal use - I've a boxful of the old Aeroclub vacform fuselage conversions, not to mention the various Brigade ones and even a few of the old M&E Tr.9s and all need donor kits. Having the moulds for the wings should make this easier. In addition, there are some of the older kits out there, such as the Frog/Novo F.XIV, that have reasonably shaped fuselages - ie not drastically wrong (Forces of Valour, I'm looking at your abortion!) - that can be salvaged with a decent wing. In total, I stripped three kits of their lower wing section, two VIIIs and a IX, one of the former giving up the wing uppers too, plus an XVIII for the wing uppers. This means I can assemble 2 C wings (early and late gun blisters) and an E wing. I have to do a little filling on the lower of the latter as it's taken from a C winged aircraft) to sort out gun hatches, but that's really it. I did notice that the VIII - an Australin aircraft boxing - came in two slightly different boxes, one of which had a catalogue number. The plastic is different too. One has upper wings with the wide early gun blisters, t'other has the late narow blister. The latter had the radiators moulded integral, the former had them separate with nice little wells. Their early Grffon Spitfire kits were designed somewhat similarly. When done and dusted, all cleaned up, wheel wells filled and given some strip detail, the surfaces smoothed and filled where necessary - Ventura kits are limited run and have some odd sink holes which need filling - they'll be mounted on a web of plastic card along the leading edge, stood vertical and moulded in a single piece mould. I've done it twice, with a Seafire IIIc wing (which needs redoing) and a Spitfire F22 wing to convert the Airfix or Ventura 19 to a 21. One thing is for sure. I do not like cleaning up those Ventura bits. They're a pig to get off the sprues, the lower wing especially, as the sprue gates are HUGE. The parts themselves need constant fettling to get them to align properly. In the end, I got two cleaned up and taped together and halfway through the third. I was beginning to lose the will to live. A test fit with several available fuselages, all from different manufacturers, proved that my idea was sound - they'll fit any fuselage, although some may need surgery to fit properly. Now I just need to get some more rubber. 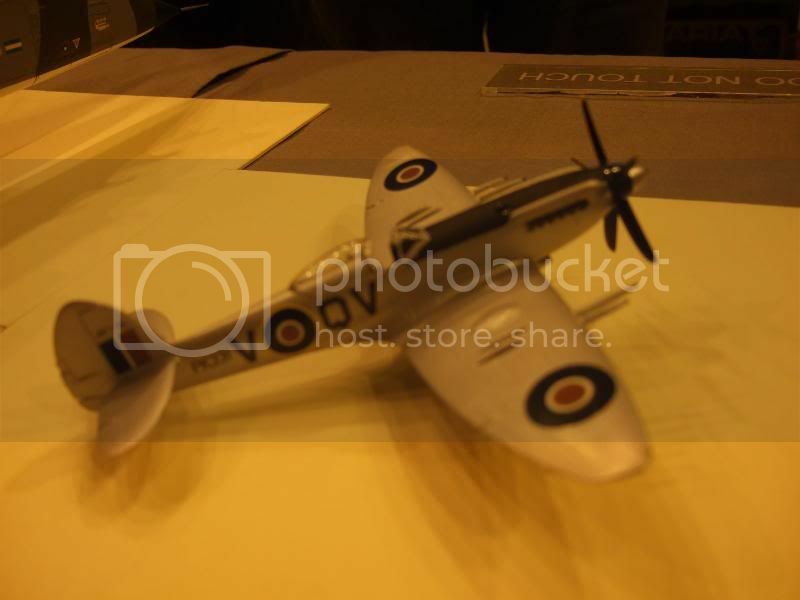 For Telford last year, I concentrated on building items for The Plan - nothing else but Spitfires or related items. At 2pm of the thursday beforehand, I had nothing finished. Out of the 50+ that had been assembled, primed, painted and decalled, nothing was finished. At 4am on the Friday, there were thirty or so boxed and ready to go. So what had happened to the rest? They were left. Some of the part finished Spitefuls were there, but remained boxed. Along the way, during the final push, I had abandoned quite a few, some were painted but undecalled. One or two were just left primed. Two didn't get the last colour and are still masked. One other needs remedial sanding before I can do some respraying. So, in a rash of enthusiasm post Telford, some were finished off. IIRC, I did about ten or so that week, including one of my favourites, the Spitfire FR26. This was the 1996 release of the CMR Seafire FR47, which they'd cocked up. The wing wheel well bulges were too small - being for a Spitfire F22/24 - and the canopy was a standard Spitfire bubbletop. Well, that was crying out to be whiffed and as my first CMR Spitfire, an absolute joy to build. Well, once the warped resin was sorted out it was. Love to get another. 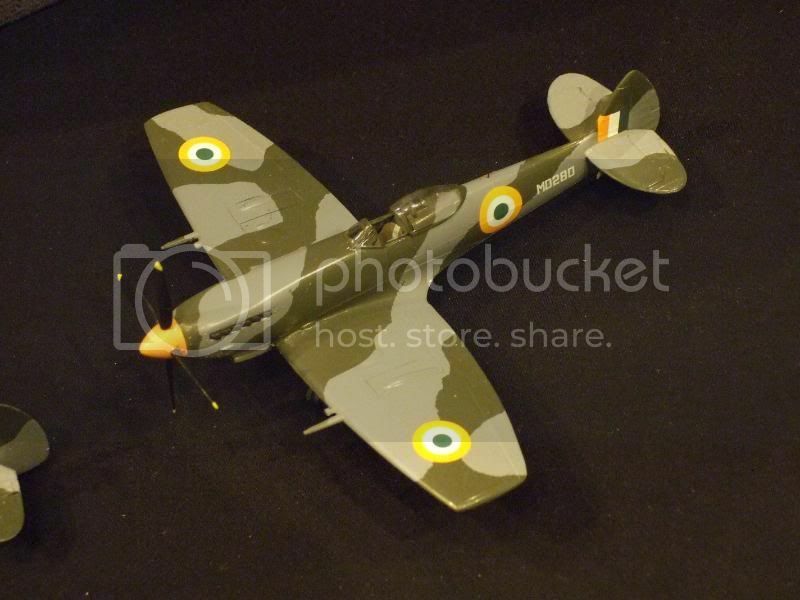 This started as a Heller F.XVIe but was finished as an Indian Air Force Spitfire LF8e. Well, that's what it should be but I'd forgot to sort out the ailerons (they're mk IX and not the shorter VIII). It's one of the hangover ones from Telford 2010 so really needed finishing. I'll redo this one properly at some stage as I'm not quite happy with it. Anyway, that rash of enthusiasm didn't last long. One thing I'd got increasingly sick of with The Plan was that I wasn't building - painting, decalling and finishing is all well and good, indeed decalling is when a bare model starts to come to life and you can see before your eyes the idea that's hitherto been a spark of imagination - and it's just building the things that I really enjoy. Cutting bits up, sanding and throwing together is something I find quite relaxing. Well, sometimes. That being the case, in the runup to christmas, about 10 more airframes were built, mainly Heller 16s but some Airfix PR19s as well. More ideas, you see. So, 2012. Mention of Operation Cosford elsewhere on the site prompted me to finish off something stalled from 2010 so that it could be handed to Martin for unveiling at the Cosford show (and no, I'm not giving any hints other than it's RAF and most definitely NOT a Spitfire). This made me dig things out and get them finished and a fresh look at the Hangar Queens of 2011. The Xtrakit Spitfire F22. Moulded by MPM and this pig of a kit fought me every step of the way. The wing wouldn't close with the wheel well detail bits in place. The moulding surfaces needed serious thinning. The prop went in the bin as it's waaay too short and the blades are the wrong shape entirely (the old Testors 22 has better blades that this!) The fuselage wouldn't close with the cockpit parts in and it's apparently too short. I think it's too wide. The wing didn't want to go onto the fuselage, the canopy doesnt close properly if the door is closed (that's actually a fault in the distructions, they tell you to use the wrong rear section). in the end, I just used an Airfix 19 prop and an Aeroclub canopy rear. This one will be redone when I get my hands on the Airfix 22. Both photos taken by Aircav at Huddersfield a few weeks back. Having added some pics, I went back through the Picture post to try and pull all of my Spitfire stuff into one thread. Or at least link them. I don't - and won't - use external photo hosting, for various reasons I cannot be bothered to go into. Interesting comment from me about the then forthcoming Xtrakit Spitfire F22. Little did I know just how much of a pig it was going to be. That one may get redone with either an Airfix 22 or a hybrid Ventura kit. Looking at the 2 Sqn one, I'm minded to redo it. The spine around the cockpit needs fixing and the canopy is yellowing. Last night, more sorting through boxes. This time to sort out the bench and tie things assembled with the actual hard copy of The Plan, as opposed to the one in me head. Really, it needed doing, if only to tidy the place up. In doing so, I realised I had three more Airfix IXc's than I thought. They can get tidied away into the stash. More bits also for the spares box too. Sort of. The forthcoming Airfix F22 wing does fit the Airfix PR19, so the two that were donated by Overkiller (thanks again, Duncan!) were allocated for conversion to F21s (both F and FR versions) and have already been separated. The cockpits are assembled and painted, meaning the fuselages can be closed up this weekend and put to one side. More mess out of the way. One of the great things about Spitfires is that when splitting kits or conversions up, they can be combined with others, meaning no waste. The leftover wings from the two 19s have already been allocated elsewhere. One is being combined with an Airfix Ia fuselage (original tooling) that I'd done some surgery to some years back to get this wing to fit. And promptly forgot about. I should be able to find the rest of the bits in the spares boxes to assemble a complete airframe plus a Falcon PR canopy and I should have a PRIV. No real idea of scheme, but overall PR blue is most likely and I've some idea of a foreign operator for this, one which did operate Spitfires. The second... More involved. A chance extra in a Magna Spiteful bought last year was an Airwaves Seafire FR47 engine cowling and I had the bright idea to put it on an Airfix PR19. Chopped the engine off and then left it. As usual. Bits of other airframes in the box included a homecast F18 fuselage with the engine and tail cut off (dodgy cast), an F22/Spiteful fin and a pair of F21 wings. I'm sure they were going to be another attempt at a PR25 but I'll need to cast the interior for that first. At Telford, amongst many purchases, I got the Freightdog PR11 conversion. This uses the Airfix 19 as a basis but again, bits can be split. The 19 with the engine cut off will get the PR11 front end and radiators but I'll be keeping the big tail as I'm liking the idea of a PRX trials aircraft with a big tail and contraprop plus one of the late Merlin developments, which by all accounts were pretty powerful. The slipper tank will get used elsewhere but the fin conversion bits will eventually go onto another 19. That I'm considering as an early 14 which had the mk 8 tail. Whilst I'm blathering on about the same subject, a dig through the spares box a few weeks back yielded several Airfix PR19 wings - these having been converted to other marks (21s mainly). What to do with them? The Revell Vb isn't a bad kit, it's just that the prop is wrong, the radio behind the seat shouldn't be there and more importantly, no gull wing underneath. I have quite a few of these stashed away, included a load from an ebay wing. However, with some surgery, they are salvageable and these spare wings are ideal. More PRIVs or possibly something else. I may need to get some decals for the latter. More ideas = more expense = more bits for the spares box = more ideas = more expense. Trapped in an enjoyable Moebius loop or just insane? Scrabbled around in the spares boxes to find some of the bits needed for the Airfix Mk Ia/Heller XVIe mash up and ended up with an extra wing and an extra fuselage. So it gets a companion. One will be an FR machine, the other a fighter bomber. A good whiffer has a mind that can 'freewheel' - one idea leads to another and then another. The Moebius loop I refered to earlier in the blog. Some of the bits that were going to go on the mash up were test fitted to a part started new tool Airfix Ia (which will be a PR1G eventually) and they really looked the part. So much so, the I/IIa I'd just bought got started straight away. I'd bought it so I could strip out the large Va oil cooler for the PR1G but that went by the way and I just got started on me new idea. That led to thinking about more along the same lines and I realised I had a requirement for two or three more IIa kits. Sunday. Dug out a mk Ia and a IIa and made a start. One was to be the second of the upgraded mk Is, the other an early machine - haven't whiffed many early mkIs but there is plenty of scope in the proposed foreign orders. So, I then started digging for bits. Amongst all the props and airframe bits, the box yielded a pair of four blade props, the exhausts for two aircraft, pointed rudders - and two Airfix Va oil coolers. Hurrah! No further expense. Well, at least for a while. Bits cut off sprues, spare bits refilling the spares boxes. Wings assembled, one of which was clipped. Really does make a Mk Ia look different with them clipped. I also decided to do a Vb to similar standards and had a load of Tamiya bits snaffled off ebay, enough to make one complete airframe plus spares. Tiny bit of surgery to one fuselage half to remove the rudder. It's easier to do the upgrade to the Tamiya one than the Airfix Ia, because the Tamiya kit comes with both windscreens - later Vs had the windscreen adopted from the IX onwards and many older machines were later retrofitted. Aparently it gave an extra 5mph. The two F21 conversions are now closed up and once I havce the props assembled, both will go to one side to await the new Airfix 22. The PR.X trials aircraft has the new Freightdog engine fitted, although that needed a little fettling to allow it to fit properly. It's just dry fitted into the wing for now. Monday saw the cockpits assembled and painted, plus the PRIV now has it's wings on but with gaps everywhere. More filler! Mention of filler brings me to another cobble together job. Whilst scrabbling through the airframe spares box, I found an Airfix Vb fuselage with the engine cut off and I think it was one I'd tried to graft a Griffon on at some stage. At the same time, I found a DB Griffon engine that I'd used over 20 years ago to do one of the Griffon prototypes, not that there's much of it now. I find the early Griffon Spits quite fascinating, mainly because of all the possibilites that they open up. I'd done a Griffon IVb from a salvaged Aeroclub mk 12 fuselage conversion some time back - it's in the current Alternate Spitfire display - but again, it's one I'm not happy with and I'd like to do it again. So, this being the case, I've cobbled a fuselage together and it's currently awaiting the mass amount of filler to be sanded off. I've just remembered that I've what's left of a Frog/Novo 14 sitting in the airframes spares box - I found the engine whilst digging out bits for the Airfix airframes. I've a feeling they may work better and I can do a IVc (early) at the same time as the IVb. Mainly because I've a resin wing that I was given by TsrJoe and it really should be used up. Or should I have a go at the proposed six cannon version? IIRC, they were mocked up but never actually built. As the early Griffon was better at low altitudes - above 20,000 it was no better than the Merlin 61 of the Spitfire IX - and toting 6 20mm cannon, it would make a rather attractive alternative to the Typhoon. But this means even more ideas and more things to do. My army grows! Sometimes, whiffing is closer to reality than we think. Last year, I did a Spitfire HFVI as a Metrological Flight aircraft and then discovered that various RAF Met Flights *did* actually use the Mk VI (and the VII, come to that). Mention elsewhere on t'interweb about the RAF using various timed out fighters as bomber defence training made me think about Spitfires being used for similar purposes and as a result, reached for a Mk Ia. I've just used up my stash of the new tool Airfix mk Ia, so had to use one of the older tool (but still bang on the money shapewise) kits. Wing sanded and assembled, locating pins removed - it was one of the snapfit ones and the pins ruin the fit - and then left to dry whilst I went in search of a suitable squadron in Chris Lake's "Flying Units of the RAF". But then I find that these training flights DID use Spitfires after all. So what do I do? It's a nice idea so why not just change the scheme? Keep the RAF pattern but make the colours a bit more Luftwaffe to make the whole thing a bit more dissimilar training? So I dug out an Airfix Vc wing (which is frankly unusable as it's way too thick and mis-shapen), glued it together and used it to try out a colour test. Dark Sea Grey over Ocean Grey looks reasonably close to the Luftwaffe's RLM 74/75 combination to make it feasible and with a black spinner, the Spitfire should look suitably 109-ish. One thing that I did find in Flying Units is the use of the F22 by the Pilot Refresher flights. I'd like to see a photo of one of these to know just what schemes they wore and how they used their codes. Tempted with using a Spiteful for that. A day off yesterday meant I could spend some time on trying to get some airframes assembled, getting four closed up and the wings on two. The clipped wing on is now sitting on it's undercarriage and awaiting primer. It looks very like a mk IX now, albeit one without any guns and should really confuse anyone looking at it. The one thing about the trio of mk Ia's getting the upgrade that's been nagging me is the canopy. The older kit was easy enough to change but the newer one has the canopy firmly wedded to the fuselage to make any change different. However, there is a way round it. I taped up one fuselage and the masked off the area round the canopy. I sawed the windscreen section off and then chopped it down as much as I dare before fitting it in place. A great deal of careful sanding later, the cutout in the fuselage is plugged with the very thing it's meant to take and I can place a replacement Falcon mk IX canopy on the aircraft. Unfortunately, these come sectioned to display open, so I had to open the cockpit door. In some respects, this is a good thing as the cockpit is well detailed and worth showing off but it's a real pain for spraying, certainly for a modeller as cackhanded as me. The other thing that narks me is that vacform canopies are a pain to cut out and trim to shape. The Falcon ones are the best money can buy and certainly value for money (anyone who says otherwise is either lying, wrong, stupid or just plain miserly), but the sectioned canopies could have been designed a bit better to make them easier to cut out. The Pavla ones have sections between the canopy parts the same size and are easier to trim - it's just a pity that the plastic is quite brittle and the actual parts once trimmed do not fit. The weekend saw some activity towards getting some things nearer to completion. Three aircraft were primed - an Isreali low back IXe, a post war XVIe and an E.19. Not saying much about the latter, other than it's a 19 with a few extra bumps. Test fitting things was also the order of the day. One of the 19s that was allocated to become a 21 with the arrival of the Airfix F22 was dragged out and I started to rebuild the area around the cockpit so I could fit a new canopy. Initially, this would have been Falcon vacform one, but with my simmering resentment of vacform canopies, I decided to try fitting a canopy from the Airfix IXc instead - I have several spare and I know it fits. Out with the scrap plastic card and the files and after about an hour's work, the canopy fits. And then all my best intentions go to pot. Because I idly test fitted the Airfix IXc wing to the finished fuselage and it's almost a perfect fit. Okay, you need to trim the tab from the front and the back end needs extending or something a bit more creative, but cross-kitting the IX and the XIX will give you a XIVc. Admittedly, it works out more expensive than the Academy or Fujimi kits, but you do end up with two models from it. So I decided to go down that particular route. The tab on the front of the IX wing was trimmed down and the new wing fits but the base of the bulkhead that holds the seat fouls the wing closing up, so that needs trimming down too. Extending the back of the wing needs something a bit more creative. When I converted the XIX into a 21, I needed something to fill a similar gap and I moulded the camera section of the XIX wing. Perfect fit. However, the back end of the IX wing now needed trimming, so I quickly marked it up and cut it back. Tiny bit of plastic card to fill the gap and I now have a XIVc. Still need to do a bit of rescribing to change the ailerons but all in all, it's an easier build than the Fujimi kit and it looks right, unlike the Academy one. So, I now have a XIVc, what about an 'e' wing version? There's two ways round it. Firstly, and probably the easiest, would be to switch the upper wing gun bulges. The second would be to use a Heller XVIe wing. Again, this fits the Airfix XIX almost perfectly but would need some more filling. After the work on the XIV, I was left with an Airfix IX fuselage without a wing. I had a Heller 'e' wing to hand so did a bit of test fitting. Again, almost a perfect fit. I also had a completed IX fuselage to hand, one without a rudder, so I decided to do a IXe. The spare fuselage takes it's place so nowt spoiled. The trimmed wing piece filled the hole in the fuselage and some scrap plastic card and filler took care of the cowling gap. As I mentioned earlier in the blog, swapping wings and fuselages makes Spitfire modelling easy and the availability of decent kits of various marks at reasonable prices makes this whole thing possible with little or no waste, either in time, money or plastic. Been a quiet few nights as I wanted to do some research, namely reading Chris Lake's "Flying Units of the RAF" to find more applicable units to fly some of the more unusual creations in The Plan. Discovered quite a few and others that feed the monster even more. I didn't realise quite how many F22s flew with second line units. And again, I realised that sometimes whiffing is closer to reality than we think. Well, I'm getting closer to getting a few things in primer. All of the PR19s are in their undercarriages with the camera ports masked, the PR.X has the tailplanes on and filled, the LFIXe needs a touch of filler and I've also discovered that the Airfix u/c will fit the Heller wing. Which is nice. The FR.XIVc is also on it's u.c now and I'm very pleased with it. All I need to do now is fill the cockpit openings with sponge (the bath kind, not cakes!) and wait for the weekend - I don't like spraying primer in the dark. Well, that and I tend to feel the cold more these days. There's another reason. Daylight tends to highlight any flaws in a paint coat and spraying outside in the dark, albeit with the outside light on, you tend to miss bits. I started using sponge for filling and masking holes last year. It's light, reusable and fairly cheap - one large bath sponge costs less than a quid and provides enough for a lot of models IIRC I did over fifty last year and used about a quarter or less. Prior to that, I used damp pieces of toilet roll but they dried hard which made them difficult to extract and tended to leave tiny fibres behind which were both a mess and hard to remove. One thing I did do last night was to get the Isreali low back and a post war RAuxAF XVIe sprayed aluminium. It was still light - just - when I got home from work last night to get it done. Out into the back garden (must clear the weeds soon) and a quick blast with Halfords Gloss Aluminium and they were done. Need to do a bit of research for the RAuxAF one as the squadron I have in mind did actually have a pair of Spitfire F16s on the books but there's some doubt as to whether they actually flew or were just hangar queens for ground instructional use. I'm more minded to have it flown by the unit commander. I just need some appropriate decals and need to make a decision on whether to use wartime Type C or post war Type D markings. The latter would look smarter but the aircraft I already have in that unit's markings are in camo and with Type C markings. I'd like to keep everything in the plan in one unified scenario but I starting to think that that won't be possible sadly. If I get some time later, the Isreali one will get decalled as I'd like to get it finished soon. One of the lads at the club expressed disgust at seeing an Isreali aircraft on display a few weeks back and I wanted to do this one just to annoy him - I hate racism. I already have the wheels done - well, some four spoke hub ones are done for something else as yet unfinished and I'll nick them. I'll cast some others for the unfinished beastie. So it's just the prop, exhausts and the canopy to sort out now. The decision on the RAuxAF Spitfire 16 made me think about doing another Spiteful with the same unit, this time in overall High Speed Silver with the post war Type D markings. I have all the bits there - in fact, I cleaned up one of my resin Spitefuls a few weeks back although I think I already have something in mind for that - so may make a start on it over the weekend, alothough I really should finish the decalled and varnished Spitefuls that are staring at me accusingly from the shelf. Especially the FR16 built from the Magna kit. I was quite pleased with that so I'm not quite sure why I left it unfinished. Laziness probably. In total, there's four, but that doesn't include the four others that never got to the decalling stage. One of those got some national markings a few weeks back - I rather like the post war intruder scheme worn by the Hornets of the Church Fenton wing in the late 40s, one of which is in the old Frog kit so decided to scale it down for Spitefuls. One wearing that scheme and toting rockets and drop tanks would look rather aggresive, although it's a toss up between using the Magna kit or my own castings. The former has the deep chin similar to that of the Seafire FR47 and I have quite a few stashed away. It's just such a pig to build, although nowhere near as bad as either the AZ kit or the CMR one it was ripped off from. Actually, I've just remembered that I've a built CMR one I bought from a guy on Britmodeller a few months back. I had thought of using it as an aircraft with one of the advanced flying schools (Swinderby popped into my head immediately) but the Dark Sea Grey/Dark Green/PRU Blue scheme is quite dark and would hide an awful lot of flaws. Drop tanks... Those from the Airfix Firefly are ideal and I've several tucked away to use as masters for moulding, thanks to Weaver, but I've yet to do it. There's a pic of a Spiteful prototype with a large torpedo shaped drop tank under the fuselage and I think one from a Hunter would be ideal. It was designed to be able to carry a 1,000lb bomb under each wing too and IIRC, I have some of those stashed away too, thanks to Falcon, although I was going to use them with Hornets or Mosquito B.35s. The Isreali low back IXe now has it's markings. Just need to give it a quick blast with matt varnish, do the little bits and it's ready to go to the club. Looking at the decal sheet instructions did give me some ideas for Egyptian Spitfires though. Been a busy few weeks since I last updated this. Half a dozen are now masked to get the final camouflage colour on and one or two others need tiny resprays to touch up some areas that need remedial work. One good idea I did have was to do one aircraft as a whiff throughout it's career. For example, I'll be doing a low back IXe as a Czech aircraft, initially with the RAF, then with the Czechs, off to Isreal and then finally Burmese. This did happen with quite a few aircraft that ended up in Burma, being flown initially by the Italians or the Czechs and then sold to the Isrealis. I also like the idea of the Isrealis buying Griffon Spits from the Indians, so much so there's a PR19 at the primed stage that will end up as an Isreali aircraft, although after having seen a photo of an Isreali Mosquito PR.IX/PRXIV with underwing bomb racks, I'm tempted to add some bombs to it. However, doesn't make sense with a hihgh altitude aircraft so I may have to rethink it slightly. A PRXI perhaps or maybe an early PRXIX before they got the pressurisation. I finally got round to doing some moulding. Nothing major, just a few little bits that I'd been putting off for a while - Griffon fishtail exhausts, spare in one of the Fujimi kits and which I needed to replace the awful ones in some of the Ventura kits (managed to find 3 sets altogether), Brigand mainwheels (from the Valom kit and to replace the trully abysmal ones from the Magna kit), Firefly slipper tanks, which are ideal for Spitefuls/Seafangs and a small contract job for Magister spats. However, I've forgotten to add the Spitfire seats which I should have added to the side of the moulds. Balderdash! I need to remould some smaller bits anyway so that's just another extra one to do. I know I need to redo the Spitfire cockpit moulds as they're just about dead, as are my mainwheel moulds. Need to find the Legato F22 before I do that though. Haven't updated this for a while as I haven't really done much, other than more casting and throwing Spitefuls together. In total, there's four now with their wings on and some or all of the filler on also, plus I'm cleaning up another two. Four will be Spitefuls, two Seafangs. I've already got one BPF aircraft but would like another, possibly with the high demarcation like the Seafire 15s seen with BPF markings. Two of these use the Pegasus wings with the integral moulded cannons - I had two spare sets and decided to use them up with my resin fuselages. No fit problems, given that the resin fuselage had used the Pegasus kit as a master, one I'd corrected a flaw or two and tarted up the cockpit. I'm curious to see if my resin wing would fit the old Rareplanes vacform fuselage as I'd like another PR version or two. Or possibly a two seater, either as a trainer or a night fighter for the Navy. ASH radar in an underwing pod for that and the centreline torpedo-shaped drop tank. I've also gone back to a pair of the vile Academy FXIVcs that were being converted to F21s - I'd got them in a big box of Spits off ebay and decided to do something with them other than scavenge them for bits. I'd got one of the SAM F21 conversions mastered by Paul Lucas so that took care of one and the other was modded to take my own F21 wing. That's now on and the second lot of filler is curing. Doesn't look too bad and may end up as a Met Flight aircraft circa 1950. That way I don't have to find any guns although an F21 with just stubs is quite appealling. I'd mentioned earlier in the blog that if you've a reasonable fuselage that lacks the gull wing then it can be salvaged with a decent wing, so I've a pair of the SMER boxings of the Heller Vb that I want to do something with. The Heller kit wasn't that bad, just didn't have that gull wing and some of the bits were a bit crude, although it did have a nice cockpit interior for the time. Anyway, a test fit showed that it would take an Airfix Vb wing with some surgery to both wing and fuselage so after a half hours work with a scalpel and a file, I've now got the basis for a mkVI, although it'll have the normal wingtips rather than the long span ones and will be a training machine. I did have to go hunting for the caniopy and stripped it from a VI bought in the ebay win mentioned earlier. That leaves me with a VB with no canopy but it will end up with an Airfix Vb wing but clipped and most likely in a far east scheme with an Aboukir filter. Well, the Smer/Airfix hybrid is now together and going through various stages of PSR. The wing/fuselage fit on top is seemingly endless, but it'll be worth it in the end. The Academy 14s are now looking more and more complete, with the tailplanes and radiators on, so hopefully they can be primed soon. Some time ago, I bought some Frog/Novo F.XIVs that I intended to use as conversion fodder. One was given some surgery to take my 21 wing and there I left it until I dug it out last week. For some reason, it had a resin spine in it for a two seat trainer. Some work with a scalpel and the fuselage is now together, although I had an interesting time reaming out the resin to take some cockpit interior. In the rear I can get away with just a seat - it's pretty cramped so little can be seen - but the main cockpit will need a bit extra. I'm not looking to finish it soon - too much else to prime first, let alone spray, but I have considered a scheme for it - either standard RAF Ocean Grey/Dark Green/Med Sea Grey with Type D markings and Aux AF codes (607 possibly) or Dark Green/Dark Earth and PRU Blue with Indian markings. Plus, given that I had to rebuild quite a bit of the fuselage with filler, I'm not looking forward to taking off any masking tape lest the filler come away too. On the subject of markings, I've remembered what I was going with the second F21, I just can't remember the unit name! It's one of the flying schools and I've the markings for a F.IX which is in standard camo and Type D roundels but with a BIG yellow panel on the fuselage with black codes. That would look rather spiffing and certainly bright but will be an absolute pain to mask off, especially considering that the yellow would have to go on first. The work on the Spiteful family also crawls along, with another early Seafang now in filler and another Spitful fuselage being cleaned up. I really should get some more finished but as I've said, it's more the building of things that I really enjoy. In the meantime, for some light relief, I've thrown together a Lancastrian, although this has Merlin 85s. I'd started it a while back and it's intended for a post war training unit. Simple scheme and it may cause some confusion. Good! Part of the inspiration for it lies with a part decalled Beaufighter. I need some white outlined red code letters and found them on a Shackleton sheet, but there's another copy of that sheet in the stash so I don't feel too guilty about using it. Lancasters are threatening to derail things, because I've a pair that really need finishing plus a third that needs more work. I really should get them done and boxed, because they clutter the place up and some of them have been several years in the making. Too much to do, too little time. Modeller's curse!